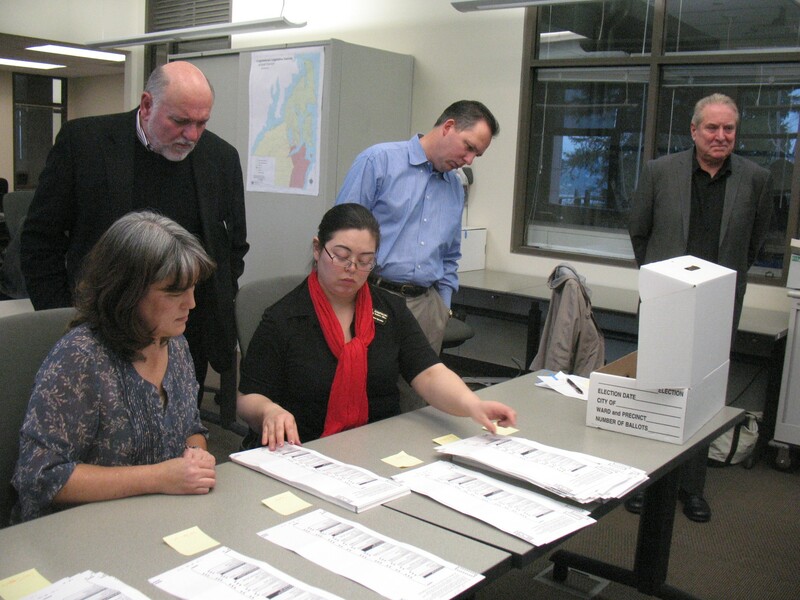 Johnson’s statement rebuts a statement by incumbent Mayor Lary Coppola that was posted on the Kitsap Caucus earlier today, shortly after a manual recount showed his challenger Tim Matthes to be the mayor-elect of Port Orchard. Coppola, completing his first term as mayor, called the group’s materials “blatant lies, half-truths, and innuendo. In an interview earlier today, downtown Port Orchard business owner Darryl Baldwin praised Coppola for his pro-business stance and strong leadership, but said Coppola may have had a blind spot for constituents who felt alienated. I was at the recount today, and I can testify that there was plenty of scrutiny by both candidates and their representatives of the meticulous process, in which ballots that had been previously run through the machine were recounted by hand. No one, not the candidates, not their supporters, not the people who were there out of sheer curiosity, had a beef with how the recount was conducted. In fact, all said Elections Manager Dolores Gilmore ran a tight ship. This, folks, is democracy in action. The voters have spoken. Despite Coppola’s widespread support among business owners, those with an interest in real estate, and other electeds from within the city and beyond (including plenty of state-level folk), Tim Matthes will become mayor Jan. 2. Coppola, no doubt, has done considerable soul searching about what led to his political demise. He has said he has no interest in running for other political office. He has plenty of other prospects, however, he said. The race was extremely close, a difference of five votes out of 3,072 cast. What this means for the city depends on how everyone left in the game — Matthes, council members, business owners, chamber representatives and ordinary citizens — reacts to the change. Matthes ran on an “I am not Lary” platform. What else can he bring? We at the Kitsap Sun will be watching. Contrary to outgoing Mayor Lary Coppola’s claims that he lost his re-election bid due to “blatant lies, half-truths, and innuendo” by his opponents, the truth is that the same voters who elected him by more than 70% four years ago had seen enough. The People for a Better Port Orchard, a citizen’s committee comprised of business owners, taxpayers, families and Port Orchard citizens – some who had supported Coppola just four years ago – simply circulated the facts about his actions and involvement in issues and decisions as Mayor. The sources for these facts, which clearly refuted his claims, were the Kitsap Sun and the City of Port Orchard. Mayor Coppola had the opportunity to correct these facts when they first appeared in print in the Kitsap Sun over the last years, but failed to do so, and by his silence agreed with their authenticity. It is unfortunate that, when faced with the scrutiny and judgment by those who have had enough of these tactics, he seeks to blame others for his own actions. Of the original precincts that first elected Mayor Coppola four years ago, not including the newly annexed areas of the City, Coppola’s support shrank from the original 70% to barely 45%. The conclusion is clear – those who have endured these last four years have had enough. It’s time to move Port Orchard forward. Shouldn’t she be studying for finals? Thank you for being concerned about my academic life. I was able to send Chris Henry my statement while on my computer writing a term paper. Political Science students spend a lot of time on their computers these days. I’m not concerned about your academic life, little girl, I’m concerned about your social life. Or lack of. Why don’t you find something age appropriate to do when you finish your term paper? Go down to the pub and have a beer or stage a college protest or something. Let the adults, and your mother, do their thing, mmmK? Thank you for the primer on your major. I guess it allows you to skip experience? ducttape, when all else fails, start calling people crazy. Did you learn that in your political strategy class at OC? It turns out she is studying for finals, so I guess it was just nuts to wonder how a college student 150 miles away has time to run a negative ad campaign in a mayoral contest during dead week. Unless she’s a shill? Where’s your buddy, dui ducctape, Mayor Gil? Just sitting back and letting the womenfolk and the children take the beating? Admirable. I’ll quit when you quit, little man. There’s a reason you work in a hair salon, you cut hair. I really disappointed in you. We’ve got young men and women in out in the military, working for college at a later time. And an adult, at 18, has the right and responsibility to vote and protect our nation. They can choose to participate. I don’t think you’ve been to college, or done a term of service. As far as college kids running political campaigns, man, you’ve removed all doubt. In all of your anger, you are unable to remain on topic as to what is wrong in the campaign flyers. You just keep attacking the college student, parents, and other people who tell you otherwise. I graduated from the University of Washington this past Spring with a similar course of study. Where did you go to school, and your major was? haha, so I guess we’ll see you out on the campaign trail soon? Which organization do you think you will shill for? It’s going to be interesting to see how the incoming mayor rewards the People For A Better Port Orchard treasurer. What job do you think she’ll get with the city? Public relations? Maybe an ethics position? By the way, being used by cowardly, nonresident adults for a political, negative ad campaign is hardly something to be proud of. Neither is sucking up to whoever can get you in the door, regardless of their political persuasion. Nor is harassing an elected official on the blogs for 4 years. Military service is something to be proud of. Actually campaigning for a candidate is something to be proud of. Serving the public without being self-serving is something to be proud of. None of those things happened in this case. Lary Coppola was charged with a DUI back in May of 2010. That’s less than two years ago. Notice that the guy is removing some content from Facebook. Now why would he censor his own forum? Possibly because Facebook gave him a warning? Negative campaigning perhaps? Promote boating safety, go help him out….